The San Jose Astronomical Association was honored recently by the City of San Jose “for outstanding commitment to building a stronger community and a vibrant city.” Sheila Sanchez wrote an article about the award for the March issue of the Cambrian Times. 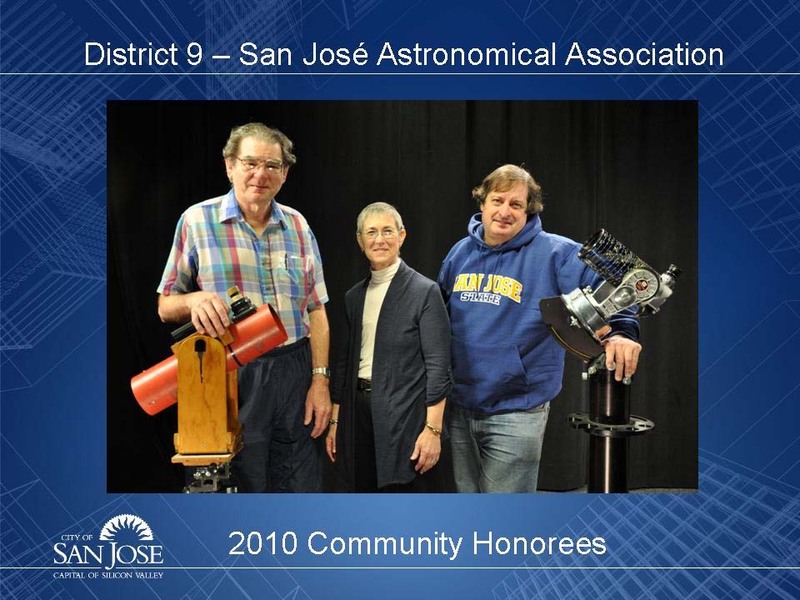 The picture (left) (courtesy of the City of San Jose) shows Jim Van Nuland on the left and Gordon Reade on the right. In the center is San Jose District 9 councilwoman (and vice mayor) Judy Chirco. The award was given on February 18 as part of 10 awards presented during Mayor Chuck Reed’s State of the City address. 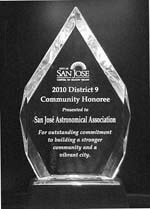 The article mentions the 60 school star parties, the program run by Jim Van Nuland for many years, and the Houge Park star parties. Photo on the right is courtesy of Jim Van Nuland.